Our product range includes a wide range of a natural bio stimulate. Probion is the most concentrated product based on proteins of natural origin, Probion contains balanced and optimal ratio between short chain peptides , long chain peptides and free amino acids. 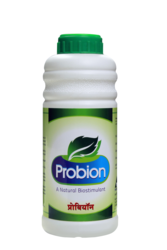 Probion is immediately and completely absorbed by the plant, in both application i.e. by foliar spray or soil application. Helps the crop to mitigate the damage done by Phyto- toxicity, pest & disease and draught.Probion is recommended in almost all the vegetables and fruit crops and other field crops like Cereals, Pulses, Oil Seeds, Cotton, Sugarcane, etc. Soil Application/ Fertigation:-1000 ml/ acre through Drip irrigation orfertigation. Foliar Spray :- 200-300 ml / 100 Liter of Water. Probion is compatible with almost all commonly used pesticides ,bio pesticides and bio fertilizers. Looking for NATURAL BIOSTIMULANT ?